When you need to move a whole lot of people, you need a van that is reliable and spacious. That’s why you need the 2017 Toyota Sienna In Bozeman. Don’t settle for a vehicle that puts the squeeze on your passengers and your wallet. The Toyota Sienna is the perfect balance of size and performance. Ressler Motors can’t wait to let you experience the Sienna for yourself. Give them a call today, and they will have one ready for your inspection at your leisure. With full financing and vehicle maintenance available, you won’t want to buy anywhere else. Being in the market for a people mover doesn’t leave you bereft of choice with the 2017 Toyota Sienna In Bozeman. With five available models, you can be sure that whatever your requirements and budget, there is a Sienna that will fit your lifestyle perfectly. 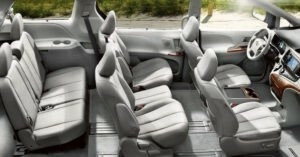 If you have a passenger that needs a little extra help embarking and disembarking, the available Auto Access Seat makes motor vehicle travel accessible to everyone. Driving a passenger van doesn’t mean that you have to miss out on all the fun. The 2017 Toyota Sienna In Bozeman provides a stylish interior for up to eight, powered by a 3.5L V6 that won’t let you down in the power department. Matched with an eight speed automatic transmission, you will always be in the power band and with available all-wheel drive, you can be sure that every wheel is working in unison to give the safest drive. You get plenty of options with the 2017 Toyota Sienna In Bozeman. The best one is picking the color that you want to take home with you. Does Predawn Gray Mica take your fancy? Or does Salsa Red Pearl sound more like your thing? Whichever one you choose, Ressler Motors know that you and your family will love your new Sienna. Take a test drive and take one home today.